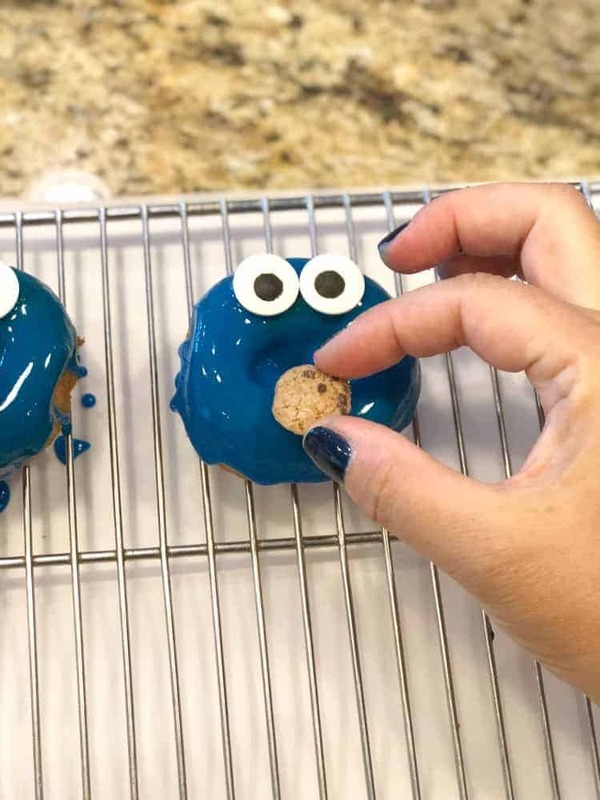 Yummy and adorable Cookie Monster Donuts are a quick and easy dessert to make that will delight your kids. 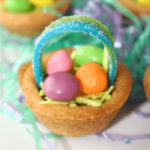 In 5 minutes and with 6 ingredients you can make this adorable Cookie Monster dessert. 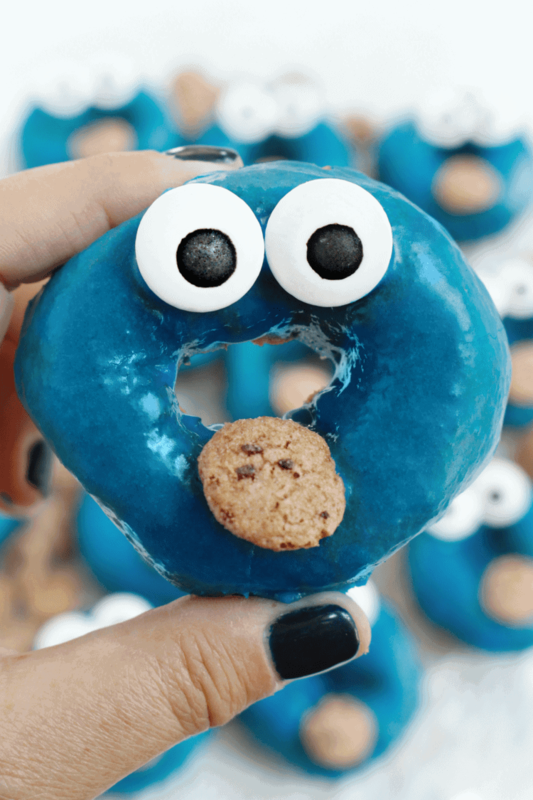 We love themed desserts and these Cookie Monster Donuts are no exception! Some of our all time favorite food crafted treats are our Melted Snowman Chocolate Bark and our Hot Chocolate Cookie Cups! Everyone loves the Cookie Monster! I mean how can you not. His big blue face, adorable googly eyes and of course, his over the top love for cookies! With school about to start and I thought there was no better way to improve the mood in my house then a fun back to school treat. So I dug deep into my inner child (it wasn’t very hard) and grabbed my favorite candy eyes and got to work. 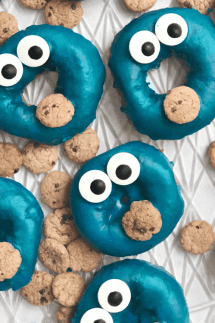 What does the Cookie Monster have to do with school…well… nothing, but that doesn’t mean these adorable Cookie Monster Donuts won’t make my kids smile. 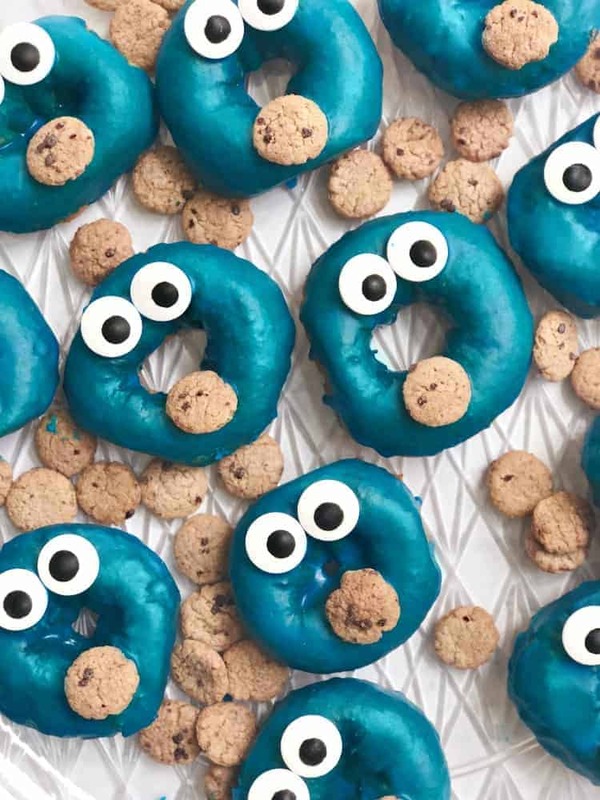 These yummy donuts also make the perfect dessert for a Cookie Monster themed party. We had a Cookie Monster Birthday Party for my son when he was turning three years old and I wished I would have made these. Speaking of a cookie-licious dessert that Cookie Monster would gobble up…how about this Edible Cookie Dough! Everyone knows the best part of making cookies is eating the raw cookie dough. This one is totally safe to eat raw! 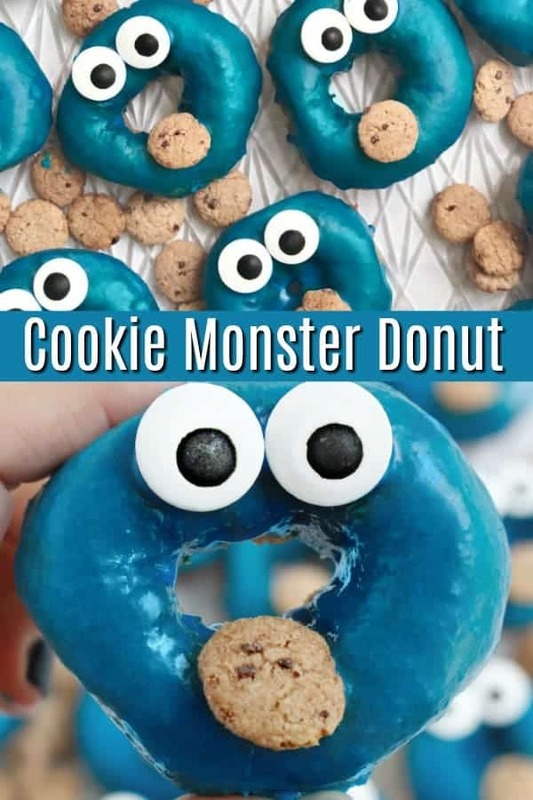 Our Cookie Monster Donuts are really easy to make. Honestly, I would struggle to even say we are “making them”. We are actually just assembling them. For our donut recipe we just used store bought donuts. If you are up for the challenge, we have a yummy baked donut recipe that only takes about 40 minutes to make. If you have the time, there is nothing better than a homemade donut! (just make sure you allow time for them to completely cool. For today, we didn’t have a ton of time to make our own donuts, so the store bought donuts would have to do! Next, we made the glaze. Which is really easy and only takes a few minutes to make (see the how to make donut glaze below). 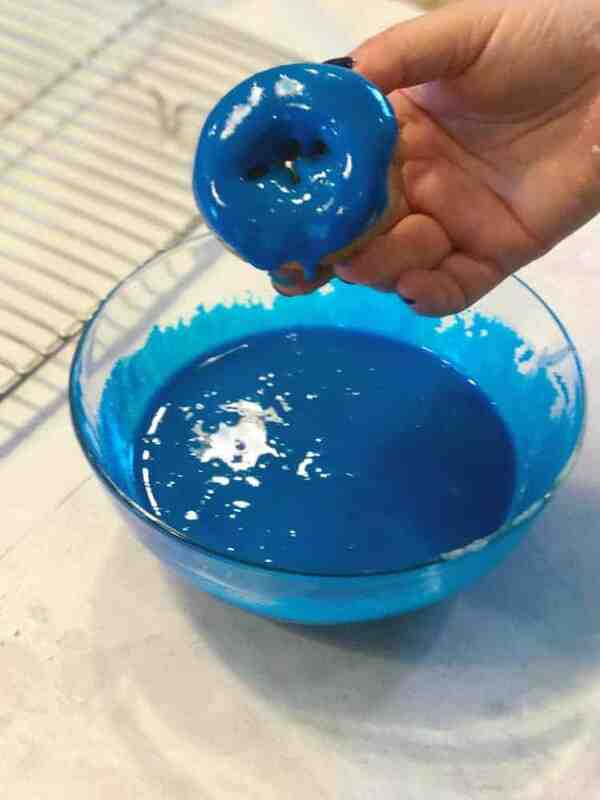 Once your glaze is ready, put a few drops of blue food coloring until you get your desired blue-ness! Have a wire rack with some parchment paper or wax paper under neath it (to catch the dripping glaze). Dip each top of the donut in the glaze and place on the wire rack. Place two oversized candy eyes and one mini cookie on each donut. For the mini cookie we used Chips Ahoy Cereal (who even knew this existed), but Cookie Crisp may be more available. Let the donuts dry completely. The glaze should harden. So, when I started making my glaze for my donuts, I realized I didn’t have enough powdered sugar. 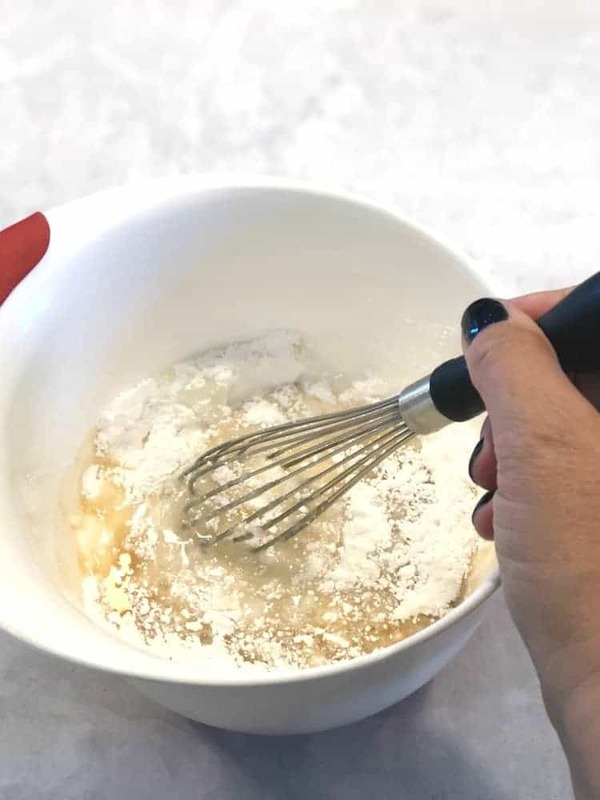 Did you know that if you have regular sugar, you can make your own powdered sugar, or confectioners sugar (which are the same thing). You can make your own homemade powdered sugar in a matter of seconds! All you do, is take about half of the amount of powdered sugar in granulated sugar (I needed 2 cups powdered sugar, so I used about 1 1/4 cups granulated sugar). Place it in a blender or food processor. Blend it until it is light and fluffy. You can use it right away or store it in an air tight container! Never run out of powdered sugar again! 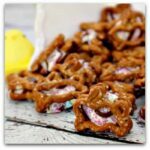 Cookie Monster Donuts are a quick and easy dessert to make that will delight your kids. In 5 minutes and with 6 ingredients you can make this adorable Cookie Monster dessert. Whisk together powdered sugar, milk and vanilla. Add in blue food coloring until desired color is achieved. Prepare a wire rack with either wax paper or parchment paper under it (to catch dripping glaze. Dip the top of the donut in the prepared glaze and place on wire rack. Immediately place two large candy eyes on the top of the donut and 1 mini cookie under the "mouth". (they will stick on the glaze as it dries. I love thís idea, although our son is a teen, he and his friends would love these cute donuts. these are hilarious! Thanks for sharing your cookie monster treats!